Can't find it, I have two recordings with Bonyge and Pavarotti and they are live, I guess (could such bad sounds quality come from studio?). I've just listened to Damrau/Florez recording from Met (2010) and it's great, I like Damrau more than Dessay and prefer how Florez sing those high C's in Mes Amis more like staccato. But I wouldn't say it's clearly better recording than the one with Dessay. I've seen criticism elsewhere that Sills ornamentation distracts from it's Donizetti authenticity, though. Last edited by MattExcell; Dec-15-2011 at 12:11. Last edited by DarkAngel; Dec-15-2011 at 20:21. Thanks DarkAngel. It's such a shame about the sound quality on the Callas. He's ridiculously under-appreciated. What I love is that, once you start scratching beneath the surface there is just layers and layers of great operas which the casual fan just isn't even aware of. One of my favourite pieces is a duet from L'assedio di Calais off the Elina Garanca Bel Canto CD. Heavenly. 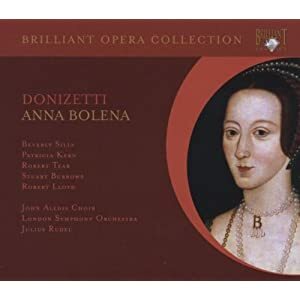 Would you recommend the Sills Roberto Devereux as best? I would think a darker voice would be pre-requisite? Last edited by DarkAngel; Dec-19-2011 at 14:15. I thought the Sills Anna Bolena was really good - enjoyed it very much. My only gripe would be the tenor arias from Stuart Burrows. He was fine in ensemble, but I found the falsetto very off-putting in solo, so I supplemented by downloading the individual track by Jerry Hadley (from the Sutherland recording) for "Nel veder la tua costanza"
Very happy with it though and would add my recommendation. DA - would you strongly recommend the Sills Maria over the Sutherland Maria? I'm concerned about Stuart Burrows presence on the Sills compared to Pavarotti on the Sutherland. Is it a case of superior Maria trumping inferior Dudley? 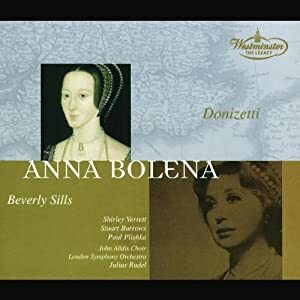 Hate to tell the folks responsible for these covers, but the lady shown on the right is not Mary Stuart, but her cousin, Mary Tudor (Elizabeth's older half-sister). Last edited by MAuer; May-30-2012 at 18:29. 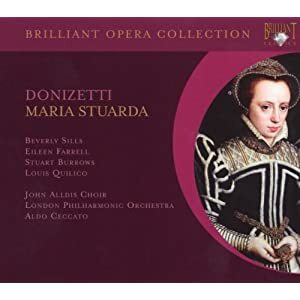 What is it with Maria Stuarda covers? This one is Anne of Cleves, her aunt (briefly) by marriage. Not even the right time period!